get in (in pink) and Shelly's in purple behind me. officially at 16 miles. See the scenic dirt behind me? 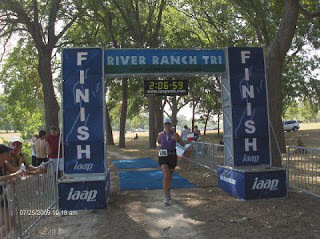 I did the River Ranch Triathlon in San Marcos, TX today. 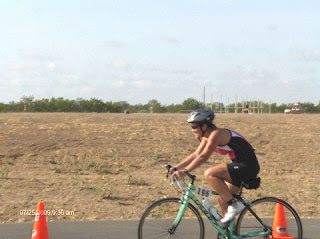 It was a really hard race - a 400m swim, 14 mile bike (although my computer says 15.6 miles), and a 5K run. On the surface of things, that doesn't sound like a difficult race - but it was. I'll provide the caveat that I did the race at the last minute after about 3 hours of sleep snatched here and there last night. Lucy the ridiculous cat ate another rubber band and threw it up yesterday evening, resulting in another (expensive) trip to the animal hospital. I don't know where she is finding them; we have turned our house upside down looking for them, but she managed to get another one. The vet took X-rays, kept Lucy for observation, and repeated the X-rays around midnight. Then she called to give us the results (Lucy is fine...again), and we went to pick Lucy up. I spent most of my time last night intermittently crying and feeling sorry for Lucy and myself and trying to sleep. After we learned that Lucy was going to be okay and brought her home, I decided to go ahead and drive out to San Marcos for the race, because after all, I had paid a $60 entry fee. And I really was excited about doing my first Sprint distance race. I'll admit that I felt like I was falling asleep at the wheel on the drive out there. I got lost on the way and had to call Shelly to help me navigate to the race. She was standing there beaming next to her car when I arrived. We unpacked our cars and took all our stuff over to the transition area and picked a spot to put our bikes. 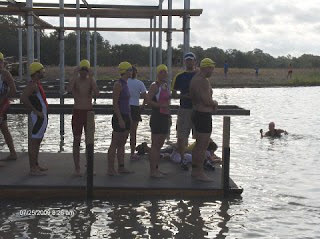 The race started at 8 a.m. with a time trial swim start. A participant started every 5-10 seconds. Because I'd signed up late, and the start went in order of race number, I was the 196th person to start. I think there were 6 people who started after me. I felt great during the swim. After that confidence-building swim workout last weekend at Boerne Lake, I felt fine swimming the distance in the small ski lake, breathing every three strokes, with my face in the water properly. I felt myself taking off too fast and slowed myself down. I even managed to focus on form. I need to work on my sighting, because I swam way off course to the first turn, and could have saved some time by taking the shortest distance instead. Transition 1 seemed quick. As I started the bike ride, I immediately had trouble because my left cleat wouldn't clip in to the pedal. I stopped to brush off some of the dirt that had wedged in there, but the clip still wouldn't clip in. I gave up and kept riding. My foot slipped off the pedal whenever I shifted from the big ring to the small one. After about 4 miles, my foot clipped in, and I spent the rest of the ride wondering if I'd be able to clip it out again. On the hilly out-and-back course, the first half provided what felt like a massive headwind. There were crosswinds on a couple parts of the course that felt like they'd blow me right off my bike. I was frustrated with the slow speed showing on my computer. After the turnaround, the wind was at our backs for some of the time, and I brought my average speed up; I was cruising at 20+ mph for miles at a time. I was nervous about the run, and I headed into Transition 2 with a knot in my stomach. What would my achilles do? As I took off for the run, I felt it, but I felt my quads, hamstrings, and the top of my left foot more (left foot had the laces tied too tight). This was my first run in 11 days. I spent the entire run at an 11 minute/mile pace or slower. I couldn't have pushed it if I tried, though; I was exhausted. I walked through the water stops and walked up the one small hill on the course. I could say that the walking was to rest my achilles, but really, I was struggling with cramping/stitch issues. I don't have official results yet. The clock at the finish said 2:02. With my watch, bike computer, and Garmin, I timed my swim at 10 minutes even, the bike portion at 1 hour, and the run at 36+ minutes. I think my transitions were fast (for me) but I really have no idea. The winners of my age group did the whole race in 1:37 or faster (gulp). That race was hard. I had no energy at the end for the run. I know I pushed it on the bike in case my achilles hurt and I'd have to skip the run portion and DNF, but I think I would have pushed it on the bike anyway. I wanted to see what Eisenheim could do, and I know the wind slowed us down. I'm surprised to say that the easiest part was the swim. I enjoyed the bike segment the most, although I spent the entire time looking at the road ahead and at my computer for the cadence, and didn't even enjoy the scenery as it went by. The run was painful and not because of my achilles. To be perfectly honest, based on how I felt today, I don't know how I'll find the energy to finish the 10K run of the Olympic in October. But maybe I can chalk my exhaustion today up to being injured, emotionally distraught, poorly fueled, and tired. I'll be fully prepared in October. Right? Robert and I bought new road bikes last weekend at Bicycle Heaven. I named mine Eisenheim the Magnificent (Ike for short). Want to know why? After we brought the bikes home, we couldn't ride them because we had to stay home and care for Lucy the incredible rubber-band eating cat, who had just had surgery after a 25-rubber-band eating binge (she's fine now). So the next best thing was to watch the Tour de France with our new shiny bikes in the living room with us. Somehow we started joking around and calling Levi Leipheimer "Eisenheim" instead of by his given name, and that's where I got the name for my bike. We had to wait until Thursday evening to take our first ride on the new bicycles. It killed me to wait so long, especially because I have a running injury that is making me feel out of shape already (my last run was on last Tuesday!). We took a 10 mile ride around UTSA and it was fantastic. It took some time to understand the gearing, and it was a lot of fun riding with my new bike computer that shows cadence. 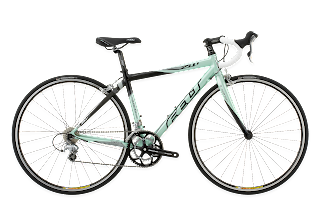 I can't believe how much easier it is to ride a road bike than a hybrid. It's like there's nothing underneath me and that I'm just flying along. We did fly - our average pace (13.6 mph) was in my top 5 of all time, races included. This morning, I went out to Boerne Lake to work out with the Tri-Sition Area group. We started with an 800 meter swim, and then rode a scenic, hilly 21 miles (14.9 mph avg!) around the Boerne area. It was gorgeous, and I spent an entire mile on the way back smiling and repeating aloud, "I love this bike, I love you, bike!" I really can't even describe how much I love this bike. We're going to go places together! I can't wait. I think I have achilles tendonitis. At least, that's what a search on the Internet tells me. I'm making an appointment to go to the doctor to make sure, and to find out the proper way to heal it. The pain has been developing off and on since before July 4, because that's when I asked Mom about plantar fasciitis, because that's what I thought it might be. But my pain is behind my heel, not under it. Online, I learned that a sudden increase in mileage, hills, or speedwork can cause achilles tendonitis, and I have certainly done all of the above in the last month or so. I knew when I looked at the SA Fit marathon training program that it was weird to be doing hill training and speedwork while building up base mileage. I signed up for the program anyway because other people had had success with it, and because it would be easier than figuring out a route every weekend for Shelly and me to run. I knew that people dropped out injured from this program, but I figured that those people were the couch potatoes who couldn't handle it, not seasoned runners like me. That was stupid. It has been almost 2 years since an injury last stopped me from running for more than a couple of days. My heel/ankle really hurt, and I'm afraid to injure them further. My last run was on Tuesday (speedwork - sigh). I'm not running for at least a week. I am going to see a doctor about it. Now that I've put that in writing, I have to stick to it. At least I can still bike and swim.